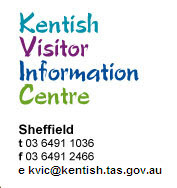 Disclaimer - Kentish Visitor Information Centre at Sheffield near Cradle Mountain in Tasmania can assist with all your accommodation and tour booking requirements. All information on this web site is correct at time of publishing. All companies listed are members of the Kentish Visitor Information Centre. Kentish Visitor Information Centre makes no representations of fact, nature, quality and suitability about any or all of the activities promoted on this site and user agrees that the user shall be responsible for first satisfying himself/herself by independent enquiry or advice as to the suitability of the particular activity. Any access of this site by the user is entirely at the users own risk and the Kentish Visitor Information Centre shall not be responsible for the propagation of computer worms or viruses transmitted from the site.